. 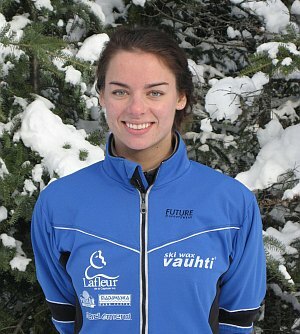 : Zoe Braul :: Ski XCOttawa.ca :: Skiing in Ottawa and Gatineau Park :. Zoe had something of a rough rookie season with XC Ottawa due to living in a risidence building full of crazy people who apparently do not need to sleep. She did however, still manage to throw down some pretty amazing results in the 2008 season capped off with a 5th place finish in the Junior Women's 15km Classic at the Canadian National Championships, which happens to be her favourite event. She is shooting for another top 5 finish at the 2009 Canadian Nationals and is sure to be a threat in any Ontario distance race she enters. She is now happily living off campus and is happy she now gets to sleep and make her own gourmet meals. This will be her second year studying at Carleton University, majoring in Geography. Performance Goals: Top 5 at Nationals, medals at OUAs.